Last month Cisco announced version 2.1 of their Nexus 1000V virtual distributed switch. Now Cisco has announced a new pricing and packaging strategy the Nexus 1000V. From version 2.1, which is now in beta, there will be two editions of the Nexus 1000V, an Essential Edition and an Advanced Edition. The Nexus 1000V Essential Edition will be available for free, plus a nominal annual support fee, in a move that Cisco believes will encourage customers and their partners to proliferate what has already become the most popular virtual switch in the industry with over 6,000 customers to date. The Nexus 1000V Essential Edition contains all the rich Layer-2 networking features to connect virtual applications to the network and integrate into VMware environments, including: VXLAN capability, Cisco vPath service insertion, integration with vCloud Director, and a plug-in for management and monitoring in VMware vCenter Server. This free version will enable rapid, low-risk adoption of Cisco’s virtual network technology environments. The Cisco Virtual Security Gateway (VSG) for Nexus 1000V, a virtual firewall with visibility to virtual machine attributes for building sophisticated compliance policies, and logical trust zones between applications (VSG was previously sold as a separate product). Support for advanced capabilities, such as DHCP snooping, IP Source Guard, Dynamic ARP inspection and Cisco TrustSec Security Group Access (SGA). 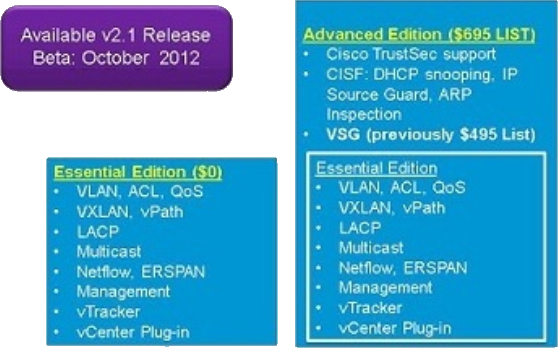 One can assume that over time, more Cisco specific enhancements will appear in only the Advanced Edition, whereas the Essential Edition is designed to support the existing baseline capabilities as well as all the open standards and features that allow it to interoperate in multi-vendor environments and with widely available management and orchestration tools. Technical support for both Essential Edition and Advanced Edition will be offered under standard Cisco support terms. Cisco is also creating additional pricing bundles for Nexus 1000V Advanced Edition that include UCS servers, and the ASA 1000V Cloud Firewall and the Nexus 1110 Virtual Services Appliance. 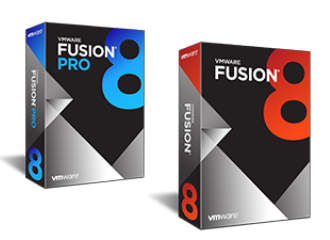 First, this new two-tier pricing structure nicely aligns with a common virtualization industry model of offering baseline functionality to rapidly seed the market and, for additional value add, advanced capabilities and future innovations. Second, customers are making architectural choices for their cloud infrastructures and many prefer end-to-end Nexus consistency for physical, virtual and cloud networks. With the Nexus 1000V Editions, Nexus customers can immediately and broadly realize the benefits of end-to-end Nexus architecture with Essential Edition while comforted by the fact that innovations will continue to occur on the Advanced Edition to which they can upgrade as and when their use cases demand. Also, these customers can leverage best-in-class Cisco TAC support for their troubleshooting needs across Nexus (and NX-OS) based physical/virtual/cloud networking environments. Finally, many cloud providers would like to build price-tiered public clouds, with multiple hypervisors (including open-source) and OpenStack cloud orchestration. With the Nexus 1000V’s upcoming support for multiple hypervisors (Hyper-V, KVM and Xen) as well as for OpenStack networking, the no-cost Essential Edition enables cloud providers to offer base networking services at a competitive price for broader market adoption, along with Cisco advanced networking capabilities at an additional price for higher-margin revenue generation. 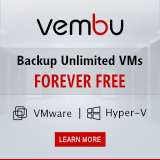 The multi-hypervisor Nexus 1000V simplifies and accelerates VM as well as tenant migration from one hypervisor to another while ensuring consistent policies, security, operational workflows (respecting separation of duties) and management/trouble shooting tools.